Audi is making room in its electric future for more than SUVs or crossovers. After a string of teasers, the German automaker finally unveiled the Audi e-tron GT concept, a four-door all-electric coupe that has some Porsche DNA sprinkled in and that looks a lot like the A7. Audi introduced the concept Wednesday during the press days of the L.A. Auto Show. The GT concept follows the September reveal of the automaker’s first all-electric vehicle, the Audi e-tron SUV that is expected to go into volume production next year. The e-tron GT is a concept for now. But not for long. 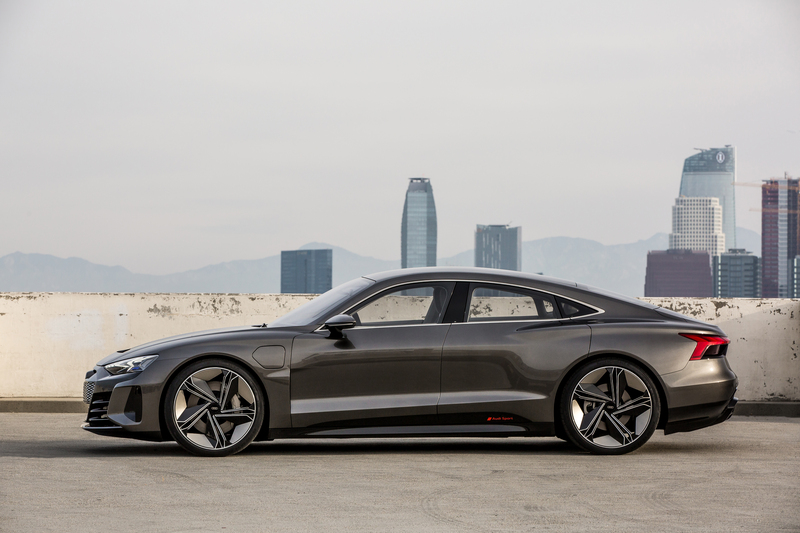 The e-tron GT concept will be developed into volume-production models by the end of 2020. Initial deliveries will be made to customers in early 2021. Audi said its performance subsidiary Audi Sport is responsible for transforming the car into a volume-production model. The Audi e-tron GT, which has a flat, wide underlying architecture and a long wheelbase, has separate electric motors fitted to the front and rear axles that produce an equivalent of 590 horsepower. The e-tron GT will accelerate from 0 to about 60 miles per hour in around 3.5 seconds and reach a top speed just shy of 150 mph, according to Audi. The interior is vegan as well — perhaps a nod to Tesla — with synthetic leather and fabric from recycled fibers used on the seat cushions, armrests and center console. 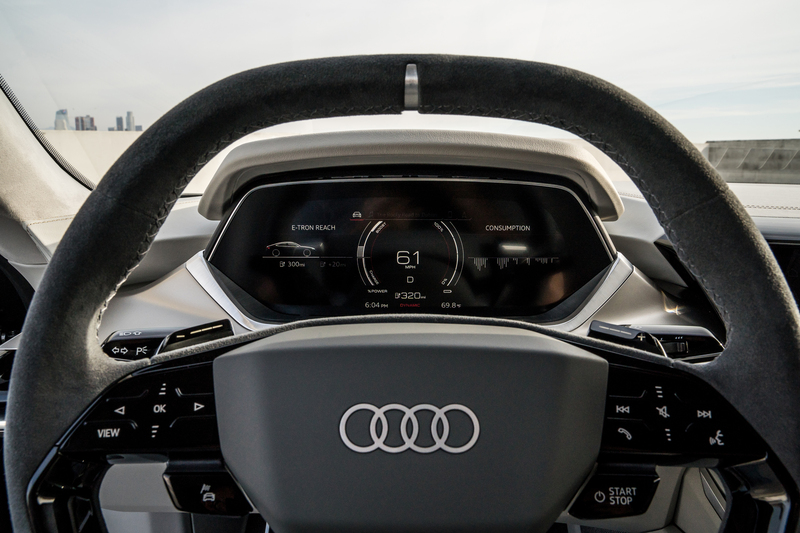 Audi doesn’t indicate whether a production version will offer a vegan interior. The vehicle has some Porsche touches, as well. The Audi GT e-tron will be built on the Porsche Taycan platform. The Taycan, formerly known as Mission E, is an electric sports car that Porsche plans to put into series production in 2019. While Porsche worked with Audi on the e-tron GT, it should not be confused with another joint electric platform project between the two companies. Audi and Porsche have also partnered to develop its “Premium Platform Electric” (PPE), which will be the foundation for multiple Audi model families with all-electric drive. The battery in the e-tron GT concept can be charged using a cable or wirelessly by positioning the vehicle over a charging pad that has an integral coil installed on the floor. It’s unclear if the induction charging feature will make it into the production version of the e-tron GT. The e-tron GT is just the beginning of what promises to be a string of electric vehicle reveals by Audi. The company has said that it will sell 12 all-electric vehicles by 2025.